Everyone is getting ready to ring in this New Year. Before you all were your new Party Wears, Party Crowns and Hats to start your fun events and celebrations and shout for the countdown in the midnight, what are the major resolutions to be brought out this year for the tiny tots? New year resolutions aren’t just for adults, but it would be helpful for the growing kids as well for self-motivating. 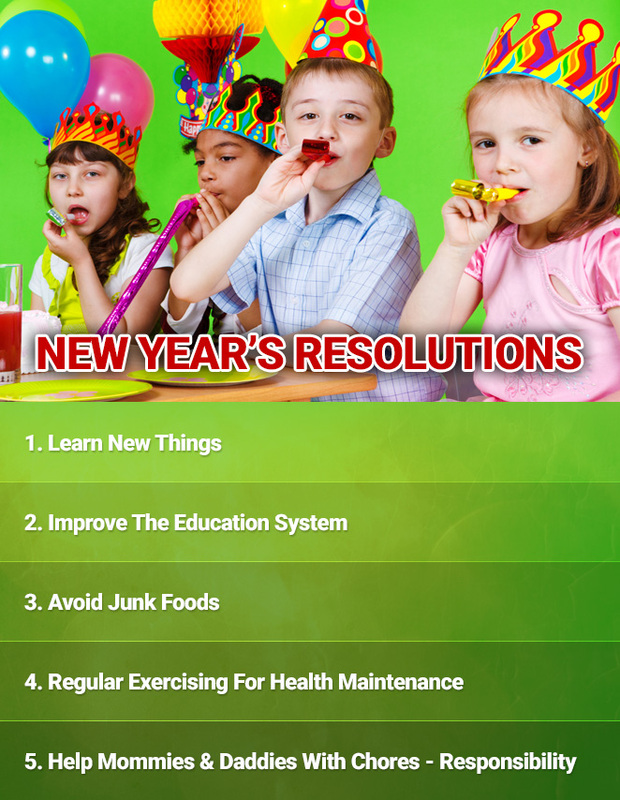 Here are few exotic New Year Resolutions for the kids who can take care of themselves considering their health, education, chores and new innovative things to learn. Let’s peep into these in detail. It would be fascinating when kids try to learn new things. Learning new things or grasping to learn an extra activity like singing, dancing, gymnastics, robotics, karate, etc.. would showcase their talent among the group of kids. Try to boost up their learning skills by just making them take an oath for the new year. Kindergarten kids would find difficulty in holding their pencils, crayons, or any other studying utensils. So try to master them during their initial stage. The small mannerism of education system plays a major role in the tiny tot’s future. So this is the right time to take their oath and master their education skills. Nowadays, junk foods are fond of all the snack eaters., it is best to avoid these junk foods and feed them with the healthy snacks. Once they become used to it, it would become a habitual process that makes their life stronger and healthier. It is our duty to motivate them with this oath for the coming year. Health and Fitness are not only mended for the adults and teenagers, it is best to take an initiative during the childhood which will lead a better and the healthier lifestyle. Every age group can take their own initiative for their health maintenance. This is the 4th major resolution for this new year 2018. Last but not least, through many chore websites and apps, parents and children are now aware of the chores. Many of the children have started to do their chores on their own, but still, some are lagging, so this is the right time for the children who are lacking to do the chores. Motivate them to take a special oath for this new year 2018 that inflicts the kids to change their attitude and behavior. The above five resolutions are not just a resolution but a fascinating one. Once your kids start enhancing these resolutions they will gain the life’s best spirit “Responsibility”, which can make them grow till where they want. Ramya Sivaraj on How do you assign chores to kids of different age groups? home & family on How do you assign chores to kids of different age groups? © 2019 Track Chores	Created by - Knila IT Solutions.